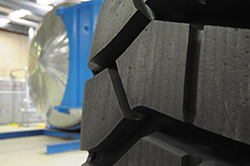 Tyres produced using Tytec's retread system are detreaded, buffed, built, and the tread designs cut on air inflated computerised modules. This system ensures that your tyres are retreaded to precise diameter and tread depth specifications. Peeling is performed to detread the tyre and to highlight separations and rock injuries. This is vital in assessing the casings suitable for retreading. Buffing assists by smoothing the working surface of the tyre this highlights small rock injuries. Time is spent diligently skiving all the rock injuries and separations to minimize the steel belt exposure. This stage is the most crucial of the retreading process, to ensure that all separations are completely removed. Final buffing is done to ensure that the texture is at its optimum to allow for correct adhesion and bonding of the new tread. The CNC computer system contours the tyre to the exact requirement for the build process. Cleaning is done to remove any contaminants from the tyre prior to applying the retreading solution. Each individual skive is filled with raw rubber compound using extruder guns and is hand stitched in to remove any air voids. This is then trimmed smooth to the contour of the surface, ready for the build process. Tytecs Auto Clave enables us to cure the largest of the 63" dump truck tyres. This equipment is computer controlled to allow precise adjustment to the flow of steam and air pressure thus ensuring the correct curing procedure. Tread patterns are applied according to customer requirements.